I didn’t have an up close and personal brush with death until I was out of the seminary and in the parish for a couple of years. As a young adult, my parents, siblings, aunts and uncles, even all but one of my my grandparents were still living and he died when I was an infant. Linda was a church member, a colleague, a kind-hearted soul who appropriately mothered my wife and me as we left school and entered “the real world.” We first met her as our real estate agent. We didn’t have a lot of money and my salary wasn’t going to be great, but at the suggestion of the senior pastor, we asked Linda to show us around and see what might be possible. With a positive, hopeful, and eminently practical frame of mind, Linda set out to show us what we could afford, and within weeks helped us buy our first home. After that, I knew her as Sunday School superintendent, organized to the hilt, yet so tuned into the needs of the kids and the teachers. She and her husband attended church every week, and over the course of that first year, we also got to meet several of her five grown children. They all adored her; what I saw of Linda’s marriage was a couple still starry-eyed in love. When she was first diagnosed with lung cancer, she almost brushed it off; just a couple of spots, she said. The doctors weren’t worried. But over the course of the next year, the disease proved to be extraordinarily virile. None of the chemotherapy had any impact, and the cancer multiplied and spread. What made it so inexplicable was that Linda had none of the risk factors. She was born and raised a teetotaling Baptist. She didn’t drink and had never smoked. She exercised, watched what she ate, and was the picture of health. She was home when she died, under the care of hospice. Maybe because I had visited so often those last weeks, I got the call early one morning that she had died. “Could I come?” her husband asked. When I got there, Linda was still in bed, her family gathered around; her youngest son who had just graduated from college, sat in bed with his mother in his arms rocking her and sobbing. It was the first time I grieved the death of someone with whom I had had such a close relationship. It was hard and it was eye-opening. It wasn’t just the sadness of loss. It was the first time I experienced so personally what felt like the injustice and arbitrariness of death. Linda still had years to live and much to contribute. She was one of those people who made her corner of the world a better place. Her death didn’t fit into my comfortable, rational categories of how things were supposed to work out. In the parish I serve, we average a little more than funeral a month. Most of them are not tragic in the sense of unexpected or untimely. They are sad; they represent loss; they bring folks face to face with the reality most of us work hard at denying, that is, we are mortal. Over the years, I’ve witnessed firsthand the broad spectrum of the ways people deal with death. I remember one woman with cancer who up until the very end was convinced there would be a miraculous cure. She forbad her family from talking of any other outcome. That was pretty hard-core denial. Other times, I have experienced the calm peace that can accompany death, standing with family around the bedside of the dying, singing hymns, praying, telling stories, and laughing the loved one across the river. Some people draw strength from their faith, from their relationship with God, and from the promises of life in the midst of death. Others find in the sometimes sudden intrusion and finality of death their faith shaken to it’s core and can do nothing other than shake their fist at God for what feels like abandonment and capriciousness. That narrator, Frank, is the wild son of the local Methodist preacher. The story opens with the report of the death of a classmate of Frank’s; it isn’t long before the reader is in the sanctuary where Franks’s father is conducting the funeral service for Bobby Cole. That same church and that very sanctuary become an anchor for the unfolding of the story. In a sense, the story reads like a who-done-it, except without a detective. Mystery surrounds many of the deaths, and it’s to Krueger’s credit that you never quite know exactly how the deaths happened; accident? murder? something in between? The small, fictional Minnesota town is populated with enough odd yet believable characters that the reader ends up speculating along with the narrator about the whos and the hows of the series of deaths. Where I think Krueger’s writing borders on the brilliant is the believable way he paints the variety of reactions to death. He allows for each of the characters, the families, and indeed, the town itself, to grow through the experience of loss to emerge on the other side of grief as someone different and wiser than before. Awful isn’t a word I often associate with grace. But this story has been yet another invitation to reflect on my own losses, struggles, pains, troubles, and sorrows. What I have experienced has been verified in the experience of others, namely that those times of suffering and pain have been transformational. And yes, brother Aeschylus, the places from which spring the fountain of wisdom. 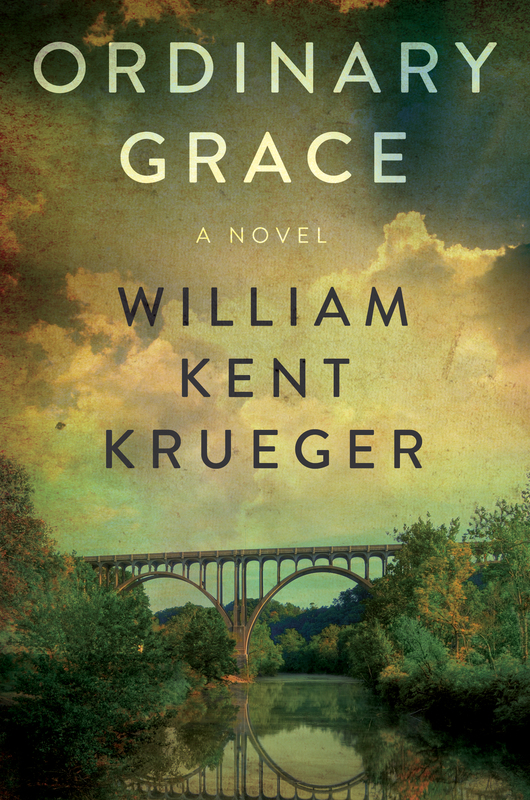 This entry was posted in Uncategorized and tagged death, lung cancer, Ordinary Grace, reacting to death, William Kent Krueger on July 24, 2014 by Jim Honig.